Midway has announced four new characters added to the Mortal Kombat vs. DC Universe roster at the Games Convention 08 in Leipzig, Germany. From the Mortal Kombat side of things, the trend of adding classic Mortal Kombat characters continues with Raiden and Kano joining the fight. On the DC Universe side, DC Comics "supervillain" Deathstroke, a mercenary and assassin who carries a blade, and the ever classic Wonder Woman. Expect a gameplay announcement from Games Convention later in the day. Check out more coverage of Mortal Kombat vs. DC Universe, including an in-depth interview with Ed Boon along with trailers available in 720p HD in our Mortal Kombat vs. DC Universe GameRealm. This pushes past the two 8 player grids currently shown on WorldsCollide.com I think their designer has some work ahead of them if they didn't plan for this earlier on. With 10 vs 10 this leaves two more characters to be announced, one per side. Any ideas out there? Aren't they only up to 9 per side? I'd guess on the MK side, it'd have to be Johnny Cage, unless they're done with the more obvious picks. EDIT: Nevermind, I'm an idiot, I misread that. I would say Johnny Cage as well and possibly Lobo now that Deathstroke is in. Deathstroke is kind of a shocker. I also think for the bosses it should be Doomsday and Shao Khan. That could be a tough duo to fight against. Man screw Johnny Cage, i hope the last one is Baraka, Kung Lao, or Goro. Cage is too lame, and we already have jax, and Kano is a bit boring too. I too want Baraka or Goro. Reptile and Ermac are contenders, but we have two ninjas anyway. And on the DC side I'm still going for Deadman, Lobo or Doomsday. I want to see Johnny Cage and Aquaman, with Darkseid and Shao Kahn as bosses and Goro and Doomsday as sub bosses. As always I'm still rooting for Shao Kahn and Lobo but DAMN Deathstroke is PERFECT! I fell in love with him as Slade on the Teen Titans cartoon series. Can't wait to see his moves. 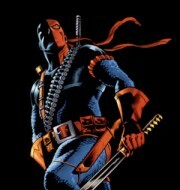 Yeah i think Deathstroke looks really cool. Wonder woman however, isnt showing her boobies off enough. :D I also read that Kano and Raiden look more like their characters from MK III. Deathstroke the Terminator... That was a suprise. I know the Teen Titans villian is populaur inside their series, but outside? I am a TT fan so I am glad to see him for a change, but it is a suprise, really it is. I was expecting one of the other villians. Edit: Now we've filled out the spots a lot more, didn't someone early on say Robin and Powergirl would be in it? I can see why Deathstroke would be in if Robin was in since Robin is a Teen Titan. But if Robin's the last spot then Powergirl is out. Unless they really do plan more characters for each side (a lot of people say 10 per side was too little). Edit: http://i53.photobucket.com/albums/g69/lost_angelwings/comics/pgwindow1.jpg or http://z.about.com/d/comicbooks/1/0/S/K/2006_04-dc080.jpg Edit: Also if Deathstrokes in, the Titans Tower might be a stage: http://upload.wikimedia.org/wikipedia/en/3/3d/Titans_tower.jpg Edit: Anyone intereasted in the characters in that last pic: The blonde I think is Wondergirl (or maybe Speedy, I don't have the issue with that pic in). The girl is Starfire. (You don't need to know much about either, but Starfires race are care-free and wouldn't think nothing of it if they walked around naked. Then again would you find a oranged skinned space-barbarian with green glowing eyes attractive?). Raiden wasnt in MK3... but i think i get your point, lol. YES! YES! YES! I knew Kano would make the cut! However Raiden was in MKT which is a version of MK3. I also want to see Booster Gold as a hidden, time lost character. They need to have some seriously well hidden characters in there to make it more fun. Amen to this, but insert Cage with Baraka. We need bad guys. DUDE!!!!!!!! I didn't ****in know that deathstroke was DC. I so thought he was marvel. This is awesome. And please baraka. Then again would you find a oranged skinned space-barbarian with green glowing eyes attractive? DeathStroke looks awesome, a lot of people for some reason online get DeathStroke confused wtih Deadpool(from Marvel) I've noticed but I like DS way more, he's a badass character. Can't wait to have Scorp vs. DS hehe. As for Raiden and MK3, he was in the game storyline wise, but not playable wise. MKT was the exception but that's not really MK3, it's just MK1-UMK3 compiled into one game where everyone til that point was playable. MKT was canonically an expansion of the MK3 story, just as MKU is to MKD. To be fair, I doubt they ever really intended for Noob to be the original Sub-Zero prior to Deception, but beyond that, the ending for Classic Sub in MKT actually states that he was discovered to be an entirely different warrior altogether and not the original Sub-Zero. Considering that, you could argue that it somehow makes sense, but I'd completely agree that it was just an excuse to stick everyone in the same game and had no effect on the MK storyline. Don't forget there were 2 Kung Lao's and 2 Raidens in MKT as well. But "excuse to have everybody together" or not it was still an expansion of MK3 so the Cage storyline still stands. Ohh yeah that's true too, Noob in fact most people found kind of "dull" until that point then his fanbase rised like a companies stocks after doing well lol know what I mean? And Garlador brings up a good point also with the classic people obviously storywise nobody's going to explain "MK2 Jax vs. MK 3 Jax" lol but it was a fun game none the less overall. Yeah, Cage's story seems to never change that much lol until MKA of course he's more serious finally. A bit broken but fun. Ohhh nooooo! They done gone and killed Deathstroke in Last Will and Testament! Those bastards! I doubt that will affect this game. Even if it is supposed to be in "present day DC Universe" I think that was meant "from the point when we thought of this game" not "up to the minute". Still, Deathstroke doesn't die he'll just come back a superpowered slave to some OTHER satanic demon with unparalleled power. I was lied to! I just read Last Will and Testament and Deathstroke survived getting stabbed in the stomach. As a side note, LWAT was a waste of four bucks. It's supposed to be a Final Crisis tie-in, but unless it happens between later issues, it makes no sense! The 3D Superman comic is cool as hell though. Totally worth the 4.50. Yeah, I know that Deathstroke getting his sword run through him in the comics has no bearing on the game, I just wanted to tell folks on the boards a little bit about what's goin on in the comic world right now. Ohh lol, don't worry dude that post wasn't addressed at you. I forgot to to quote the dude that said that.